This is an old revision of this page, as edited by DavidB4-bot (Talk | contribs) at 15:35, 9 April 2019. It may differ significantly from current revision. Robert Swan Mueller III (born August 7, 1944) was FBI director from 2001 until 2013. Mueller is faced with ethical and criminal allegations for his conduct in handling the Office of the Special Counsel. 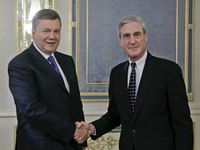 Mueller is a central figure in both the Uranium One bribery scandal and the alleged Russia collusion investigation. In May 2017, Deputy Attorney General Rod Rosenstein appointed Mueller special counsel to investigate if collusion existed between the Russian government and the 2016 Trump campaign. Rosenstein himself has been under investigation for attempting to orchestra a coup against the president. Mueller has been accused of excessive drinking on the job and sexual misconduct. His investigation became a symbol of wasted government spending in a political witchhunt. Dominated by Leftists whom Mueller hired for his staff, they have spent time and money on senseless indictments of Russians outside of American jurisdiction, who will never stand trial. Although by law the position of FBI Director is limited to 10 years, in 2011 when Dir. Mueller's term expired there was widespread mistrust of President Obama's ability to appoint a new director to a 10-year term. A myriad of questionable associations and dealings within the Obama administration went unresolved. The old Independent Counsel law lapsed, which required a panel of 3 judges to appoint an independent counsel. Under existing law Eric Holder would have to appoint a Special Counsel to prosecute himself after he was held in contempt of Congress for obstructing the Fast and Furious investigation. With a bi-partisan consensus, Mueller was asked to stay on an additional two-years unless or until Obama received a mandate in the 2012 Presidential election. Upon re-election, Obama appointed James Comey to a full ten-year term, who subsequently was fired by President Donald Trump for mishandling of the Hillary Clinton email scandal which brought the Federal Bureau of Investigation into widespread disrepute among Clinton supporters and opponents, the Congress, and the public at large. Mueller served as US Attorney for the Districts of Northern California and Massachusetts and as Assistant Attorney General in charge of the Department of Justice's Criminal Division. Director Mueller has experience in the private practice of law and is a Fellow of the American College of Trial Lawyers. For three years, he also served as an officer in the United States Marine Corps. Director Mueller holds a bachelor of arts degree from Princeton University, a master's degree in international relations from New York University, and a law degree from the University of Virginia. Mueller was appointed director by President George W. Bush because of his role in covering up negative publicity about corruption in the FBI Boston field office, and their relationship with the criminal gang run by mafia kingpin Whitey Bulger. Mueller was known to target journalists and public officials who exposed the corruption. As luck would have it, days after being sworn in as director, the 9/11 attack occurred, and the focus on FBI corruption took a backseat as the public looked to the FBI to protect them from future terrorist attacks and Congress expanded the FBI's domestic surveillance powers. Whitey Bulger was convicted at the age of 81 of 19 murders during his lifetime career as a Boston crime boss. The actual number of killings Bulger was responsible for is likely much higher. Bulger was an FBI informant against a rival gang, and Robert Mueller was cited as a defense witness on Bulger's witness list. Bulger spent sixteen years on the run as number two on the FBI Most Wanted list, behind Osama bin Laden. While on the run witnesses and evidence against Bulger continued to disappear. A commission member of the Massachusetts parole and pardons board claimed four members of a rival gang had been framed by the FBI and Bulger for a 1965 gangland killing, and were unjustly convicted. Mueller, as Assistant US Attorney and Acting US Attorney, opposed clemency throughout the 1980s for the four innocent men framed by the FBI. Meanwhile, Bulger's career as a crime boss and FBI informant flourished, with Mueller and the FBI removing his rivals from the streets. Exculpatory witnesses for the innocent men were murdered. The commissioner who maintained the four were innocent, framed by the FBI, and kept in prison by Mueller, was elected mayor of Springfield, Massachusetts in 1995. The new mayor and his administration found themselves targets of Mueller and the FBI in public corruption probes. In 2001 the four men were fully exonerated and compensated $100 million. The four had bern framed to protect another FBI informant whose brother did the actual killing. Two of the innocent men died in prison. The same year Mueller, who covered up FBI and DOJ abuses in Boston for two decades, was appointed FBI director. Mueller was confirmed as Director of the FBI by the Senate on August 2, 2001. He took the oath of office on September 4, 2001. On February 8, 2012 Mueller met with representatives from ISNA, MPAC, and other Islamic organizations to discuss purging 'Islamophobic' materials from FBI training manuals. ISNA (Islamic Society of North America) has been identified by DOJ in the Holy Land Foundation terrorism financing trial of 2007-2008 as a front for international terrorist organizations. MPAC (Muslim Public Affairs Council) has been criticized for publications defending terrorist organizations. Dr. Sebastian Gorka is among those individuals blacklisted by these organizations and the FBI. Shortly before finishing his 12-year tenure Mueller told a Congressional committee that 9/11 hijackers were under FISA surveillance, a fact unknown and unreported by the 9/11 investigating Commission and omitted from the 9/11 Commission Report. On February 11, 2003, FBI Director Robert Mueller testified to Congress that "Iraq has moved to the top of my list. As we previously briefed this Committee, Iraq's weapons of mass destruction program poses a clear threat to our national security, a threat that will certainly increase in the event of future military action against Iraq. Baghdad has the capability and, we presume, the will to use biological, chemical, or radiological weapons against US domestic targets in the event of a US invasion.... Secretary Powell presented evidence last week that Baghdad has failed to disarm its weapons of mass destruction, willfully attempting to evade and deceive the international community. Our particular concern is that Saddam may supply al-Qaeda with biological, chemical, or radiological material before or during a war with the US to avenge the fall of his regime." "Not ALL FBI Agents are moral pariahs. 60% are good American patriots who joined the Agency in good faith expecting to serve their Country and put bad people behind bars. Mueller implemented an “up or out” policy where all SSAs [Supervisory Special Agents] were required to move to DC and do Headquarters time or lose their GS 14 pay grade. This policy change by Mueller purposely targeted the most senior Agents in the FBI who had finally earned the right to move their family to a medium sized office in fly over country, had teenage kids and were living a comfortable life. In September 2009, Secretary of State Hillary Rodham Clinton arranged with the Russian government of Vladimir Putin for Robert Mueller to fly to Moscow and personally return 10 grams of highly enriched uranium (HEU) that the Department of Energy seized in a nuclear smuggling sting operation, which had been stolen from a Russian facility. Russian investigaters needed the HEU returned so as to identify which facility it was stolen from. Pay day: Bill Clinton in Moscow to pick up a $500,000 bribe for his wife Hillary Clinton's approval of the Russian purchase of an American uranium mining company. Mueller had to sign-off to make the deal possible. In 2009, the FBI began an investigation into corruption and extortion by senior managers of Tenex, a subsidiary of Rosatom, a Russian nuclear entity. Robert Mueller was Director when the FBI the investigation into the Rosatom subsidiary was undertaken. The investigation was an intelligence probe into Russian nuclear officials. Mueller's investigation obtained an eyewitness, William Campbell, known as Confidential Source-1 (CS-1) in documents, recordings, and emails. The evidence indicates Russian nuclear officials sent millions of dollars destined for the Clinton Foundation during Secretary of State Hillary Clinton's tenure on the Committee on Foreign Investment of the United States (CFIUS). CFIUS is the government body that provided the approval of the sale of Uranium One to Rosatom. During the investigation, federal agents attempted to turn Vadim Mikerin on his bosses by showing him the evidence the FBI collected of relationships between “shell companies and other Russian energy officials, including President Vladimir Putin.” Mikerin refused and was arrested on charges of conspiracy to extort kickbacks for contracts to transport uranium from dismantled Russian warheads to power plants within the United States. The investigation found kickbacks paid in cash and foreign wire transfers. From April 2009 to April 2011, the wire transfers went to Wiser Trading, registered in the Seychelles. From July 2011 to July 2013 - to the British Leila Global Limited account in a Latvian bank. And from August 2013 to May 2014 - to Ollins Development in the British Virgin Islands. Director of British Leila Global Denny Banger, a Latvian citizen, appeared as a nominal director in a hundred organizations. Latvian journalists participating in the Organized Crime and Corruption Reporting Project (OCCRP), found Banger. He was listed as the head of several firms related to the "Magnitsky case". The House Oversight Committee began an investigation into Obama administration criminal activity involving Mueller, Hillary Clinton, Eric Holder, et al in relation to the bribery scam and national security breach that occurred when they approved the purchase of US uranium reserves by Russian oligarchs who were under criminal investigation by the FBI for extortion and money laundering. Robert Mueller used his position as FBI Director to shield and cover up a $25 Billion U.S.-based criminal terrorist network operated by Fetullah Gulen, a radical Turkish jihadist. Mueller quashed whistleblowers exposing the illicit operation. During his tenure Mueller protected Gulen's criminal network, quashed and covered up reports and cases involving Gulen's terrorist-criminal-espionage operations through retaliations, invocation of the State Secrets Privilege, and hindering Congressional oversight and investigations through retroactive classification. Due to his direct involvement and his role in covering up and protecting Gulen Networks’ criminal operations by shutting down pertinent FBI investigative operations and by transferring certain terrorism related Gulen files to the counterintelligence division, Mueller has a major conflict of interest as Special Counsel targeting Gen. Michael Flynn’s case as it pertains to exposing the Gulen network and his relationship with Turkish entities sharing the same interest in exposing and extraditing Fethullah Gulen. That’s the same jihadist Flynn was investigating during his work with the Turkish government. Mueller was directly involved in quashing and covering up Gulen and Gulen Network related cases within the FBI’s Counterterrorism, Counterintelligence and White-Collar Crime divisions. The dossiers and mountains of criminal and espionage evidences on Gulen’s network resided in multiple FBI field offices, with the FBI’s Washington D.C., Chicago, and New Jersey Field Offices being the three most important investigative centers on the case. During his Russia probe, Mueller indicted "the proverbial ham sandwich." In the wake of James Comey's firing, Assistant Attorney General Rod Rosenstein appointed Mueller as a special counsel to take over the FBI's counterintelligence investigation of the Trump campaign and administration. The investigation now also became a criminal probe, alleging Trump fired Comey to obstruct justice. Deputy Director Andrew McCabe, who was already under internal investigation for conflicts of interest in both the Clinton email scandal and the FBI's Russia investigation, became Acting FBI Director. McCabe latter was fired and faced criminal prosecution. Ironically, Trump interviewed Mueller as Comey's replacement the day before Rosenstein appointed him Special Counsel. Mueller hired several investigators who were later fired for their partisanship and bias. Vladimir Putin with Oleg Deripaska. Democrats colluded with Deripaska to interfere in the 2016 Presidential election. In 2009, when Mueller ran the FBI, the bureau asked Russian oligarch Oleg Deripaska to spend millions of his own dollars funding an FBI-supervised operation to rescue a retired FBI agent, Robert Levinson, captured in Iran while working for the CIA in 2007. Mueller wanted a foreigner to fund the operation in order to circumvent U.S. sanctions law that barred spending money in Iran. They arrangement may have also violated the Antideficiency Act, which prohibits the government from accepting voluntary services. One agent who helped court Deripaska was Andrew McCabe. Deripaska ultimately spent $25 million assembling a private search and rescue team that worked with contacts in Iran connected with his aluminum business. Deripaska is one of the first Russians the FBI asked for help when it began investigating the Steele dossier. The agents posited a theory that Trump's campaign was secretly colluding with Russia to hijack the U.S. election. "Deripaska laughed but realized, despite the joviality, that they were serious," said his agent Adam Waldman. "So he told them in his informed opinion the idea they were proposing was false. 'You are trying to create something out of nothing,' he told them." At various points in the Mueller probe when Congressional hearings and public opinion have questioned the need for the investigation as Obama administration wrongdoing was uncovered, Mueller has issued "joke indictments" against Russian citizens and entities who will never stand trial in the United States. Charges against Paul Manafort are wholly unrelated to Russia collusion. Charges against Michael Flynn are based on alleged false statements made by Flynn to the FBI; the FBI agent who interviewed Flynn however reported that Flynn did not lie. Andrew McCabe is currently under criminal investigation for possibly altering or destroying the interview report, among other things. Charges against George Papadopoulos remain mysterious, as it is unclear whether or not Papadopoulos himself was an FBI informant, or a simple naive pup fresh out of school who volunteered for the Trump campaign days before he was compromised in a sting operation arranged by John Brennan. Of all the indictments, 25 are Russian "ham sandwiches," one being a company that did not even exist during the 2016 election. Three Americans have plead guilty to process charges of lying to the FBI: one regarding allegations that occurred in 2005 and 2007; one is a possible FBI informant that the Justice Department has stonewalled, as congressional oversight probes the original legal basis of the investigation; and one likely will be overturned or pardoned due to FBI misconduct. Of the three that mainstream media fake news allege to have "flipped," none have provided information on alleged Russian collusion because they have no information to report. A fourth awaits trial on charges prosecuted by Mueller that are totally unrelated to Mueller's mandate. No Americans have been accused or indicted for coordination, cooperation, collusion, or conspiracy with any Russian entity, government or private, to interfere in American elections. The indictments have solely been used to create Democratic talking points, and to hide the illegal actions of people employed in the Obama Justice Department, or who are still emloyed by the U.S. government. In February 2019, John Milkovich, a Conservative Democratic member of the Louisiana State Senate from Shreveport, released Robert Mueller: Errand Boy for a New World Order, a critical account of special counsel Mueller, whose investigation of President Trump for "Russian collusion" in the 2016 presidential election soon enters its third year. According to the website promoting Milkovich's book, the work "is really based on the ground breaking research of federal agents, whistleblowers, many people who were in government service — or still are; police officers, veterans, families of 9/11 victims, and some international writers as well." ↑ Banger played on a basketball team for a Latvian company and told reporters someone used his personal information without his knowledge. The front companies identified in the Mikeran indictment are firms that receive money for third parties and transfer them for a fee, according to a partner of Paragon Advisory Group, Alexander Zakharov. They serve the interests of a different set of people. ↑ Two additional persons who never worked on the Trump campaign plead guilty to process charges to frame up a third person who was an employee of a campaign employee. ↑ Jeff Beimfohr (February 13, 2019). Louisiana state senator authors book on Mueller investigation. KTBS-TV.